Be Prepared! Signal knocked out by a storm? Clear TV can still work if you have power. Bypass Cable &amp; Satellite. Get crystal clear HD broadcast shows free. Results may vary, depending on distance to broadcast towers and interference (mountains, tall buildings, trees, etc.). Save Money: No contracts, monthly fees or price hikes. Get These Networks and More For Free: NBC HD, PBS, Fox HD, The CW, My TV, CBS HD, ABC HD, Univision. Our Clear TV technology lets you bypass cable and satellite companies and get crystal clear HD broadcast shows free! Enjoy: Network shows, Sporting events, Local news &amp; weather, Kid's programs, and more! Incredibly clear HD signal. Innovative &amp; sleek design. Be Prepared! Signal knocked out by a storm? Clear TV can still work if you have power. Bypass Cable & Satellite. Get crystal clear HD broadcast shows free. Results may vary, depending on distance to broadcast towers and interference (mountains, tall buildings, trees, etc.). Save Money: No contracts, monthly fees or price hikes. Get These Networks and More For Free: NBC HD, PBS, Fox HD, The CW, My TV, CBS HD, ABC HD, Univision. Our Clear TV technology lets you bypass cable and satellite companies and get crystal clear HD broadcast shows free! Enjoy: Network shows, Sporting events, Local news & weather, Kid's programs, and more! Incredibly clear HD signal. Innovative & sleek design. If you want to see true HDTV in High definition you'll need an Antenna like this one. Free over the air local digital television. The picture is incredible on a Plasma TV. 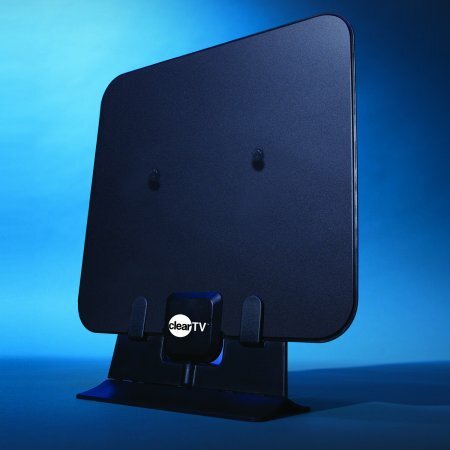 This Indoor Antenna is a winner and for the price, unbeatable. This one works better than the one that I paid more money for. Install is simple. Connect cable to tv and do a channel search. That's it. Remember it only gets local channels. The only issue I have is it needs a longer cable which cost extra to order. Other than that it's two thumbs up. I do not watch much TV so I was paying for basic cable for years. The cable company kept raising my bill even though the quality was the same and the number of channels was the same. I bought this antenna out of curiosity. What a surprise. It picked the same number of channels with the same quality as my basic cable. After a few months, I decided to dump the basic cable and I'm saving $45 a month with the $14.88 antenna. I bought five of these for Christmas presents for friends and family. The only problem I see is the plastic covering gets bubbly at times (the heat) but doesn't affect the performance. Great product! I love it. this thing is awesome. i had many doubts but it works beyond my expectations. I even bought a 2nd one for my living room. first time I didn't even hang the antenna up and got 11 channels, cw, abc, local channels. When i hung it up on the window, it scanned and found 29-32 channels. Perfect HD quality. The only antenna I've bought so far that actually works. It picked up all local channels except for maybe like 1. I don't even have to put it near the window and it picked up IMMEDIATELY. And thank God it's small/not chunky and heavy. It's lightweight, comes with suction cups and screws whichever you want to use. Good quality and cheap, would definitely recommend! I got this for my bedroom t.v. because my boyfriend loves to watch sports everyday and I really don't care for sports. I got like 30 useable channels and also got a bunch of foreign channels. I bought my tv for only 120 bucks and this for only 15 bucks and so for just 7 bucks a year I have t.v. in my room. It Works in Corona, Ca! We saw this at Walmart and decided to try it. We are currently paying around $15 for basic cable - very basic channels and we only watch about 7 of the channels. We figured if we could pay $15 and get those same 7 channels it would be worth it. SURPRISE!!! We hooked this up to our big tv and it found 137 channels!!! Most are various languages but there are around 40 English channels that we will watch! Spanish speakers would also have a huge selection! There were also Chinese and other Asian speaking channels. We have more channels available to us with this antenna than with basic Spectrum cable! NOTE: it took me a while to figure out my tv's menu settings - you have to switch to "antenna" and then do the channel search. For people who get nothing I would encourage you to research your tv's settings. We are thrilled that we decided to try this! We are in a great area to pick up stations. We are going to save so much money!!! You can check you address on this website to see if you would get a bunch of channels: www.antennaweb.org. If you have basic cable you just have to try this! This is the best tv antenna for the money if you setup your tv right it works great you have to set your tv to pick up the channel you have to go to source on the remote that came with your tv to see if your tv is set on cable then go to menu make sure it says tv then put on antenna hit serch for channels it will take about five or six minutes for serch it will tell you when the search is finished then hit enter you are set,I live in Florida this worked great whenever the cable was down for a week we just went threw a harracane it was bad ,pray for the families that lost their homes I was so lucky. You have to set up your tv like it is new and this will work great. I have bought four of these antennas -- two for my home and two for my RV. It should be noted that this product will NOT broadcast basic cable channels!!! It is only meant to receive free LOCAL digital channels. That being said, I have moved a total of four times in three years due to health issues. I have never once had any problems whatsoever picking up at least fifteen local digital channels (all of my homes were approximately thirty miles outside of major cities). When I travel in my motorhome, I always am able to enjoy at least six to ten channels when i am driving down the road, as well as when I am parked in a rural campground. Common sense dictates that this unit will not work well if it is used in extreme rural areas; where the signal transmitter antennas are at least 40 to 50 miles away; in rugged mountain terrain or in extremely low valleys; in an apartment or concrete office building if it is placed next to a solid wall or corridor; or when extreme weather conditions exist. No digital antenna on the market today, regardless of its advertised "high power" capability and performance (especially at this price point), can or will work in every situation and location. (In fact, this antenna actually outperformed the expensive $89.99 piece of junk I purchased at Best Buy. In summary, the Clear TV Antenna is easy to install, and well worth the $14.99, as long as your expectations are realistic and attainable. Thank you for reading my review. I couldn't get it to work. I moved it all around both my rooms couldn't get it to work. My friend has one and loves it. We don't know why it won't work in my apartment. I found an old used antenna from about a decade ago in my garage that actually picked up the same amount of channels as this thing.. When I plug my cable cord from the wall into my tv, I get over 100 channels which is twice as much and I dont even have to mount some crappy plastic thing on my wall.